As a makeup newbie, I have read, scrolled, and watched my way through a ton of beauty blogs and makeup videos trying to figure out exactly how the beauty gurus blend and brush their eye makeup to perfection. Of course, it's patience, practice, and talent that makes a good makeup artist, but if like me all you are looking for is an easy way to start using that eyeshadow palette you just bought, try these 3 easy/basic steps. 1. Prime the eyelids. This helps hold the eyeshadows in place and also brings out the colours better. 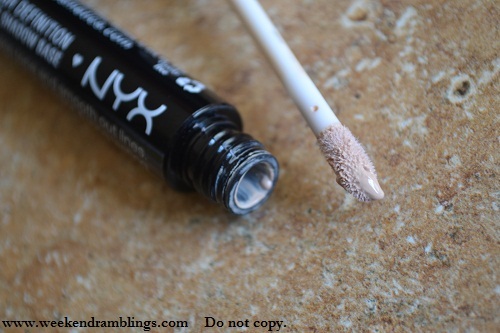 I use the NYX HD eyeshadow base. 2. Pick the shades you want to use. You could use any colour you wish to, but for a basic eye makeup, select 3 eyeshadows in the same colour but different shades/intensities - a light, a medium, and a dark shade (for example - a pale beige shade, a shimmery bronzy brown, and a darker matte brown). You could also substitute the darker shade with black for a more intense look. If you have a trio or a quad with instructions on the colours, you could just stick to that. I am using the Wet n Wild Knock On Wood Trio. 1. Apply the medium shade to the entire eyelid. Use a flat eyeshadow brush and a patting motion to deposit the colour all over the eyelid. Do not take the colour right up to the crease but stop just short of it. 2. 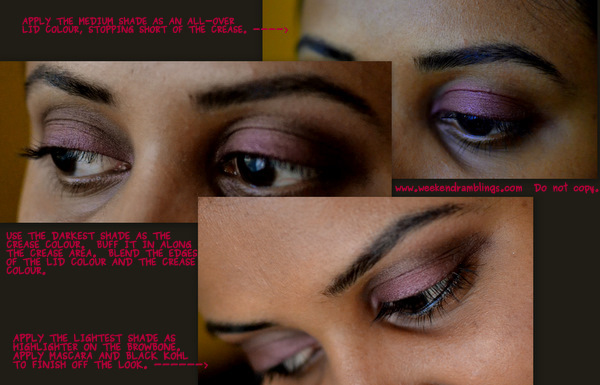 Use the darker shade in the crease area. Use a tapered/dome-shaped brush to buff the colour in. An easy way to find your crease area is to follow the contour of your - the crease would be the line you would feel along the eyeball as it disappears into the socket. Raising your eyebrows up gently while blending makes it easier to apply the crease colour. 3. Use the lightest shade as a highlighter over you browbone. A guide to placing this is the eyeshadow should mimic and catch light in exactly the same way as your skin would normally do in the sun when you move your face sideways. Wet n Wild eyeshadow trio provided by PR.